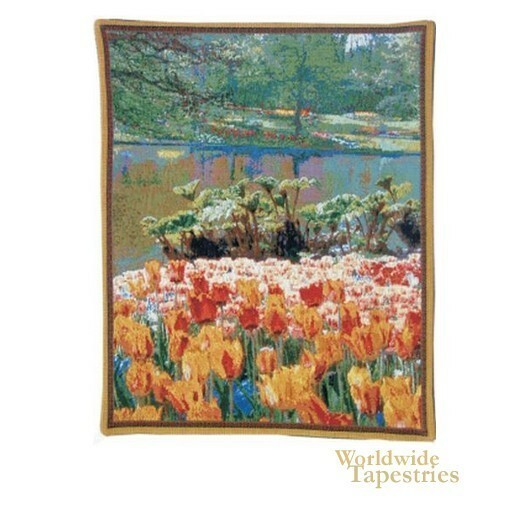 Kuekenhof I - Mini Left Panel tapestry shows a gorgeous scene from the gardens in Holland. Famous for its hundreds of thousands of bulbs planted every year, this garden is a feast for the senses. Here we see a view of the colorful tulips in full bloom, in orange reds, and white pinks, before a still lake. The lake beautifully reflects the woods beyond. The trees beyond also provide shelter for even more tulips hinted by glimpses of color. This Kuekenhof I - Mini Left Panel tapestry is backed with lining and tunnel for easy hanging.